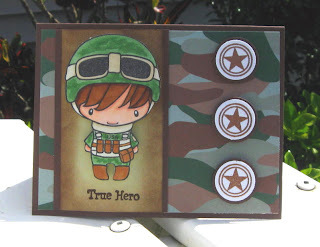 This week's Featured Stamper on SCS is Dawn Lusk (a/k/a DawnL). In looking through her gallery I found a couple of cards I liked and wanted to CASE. 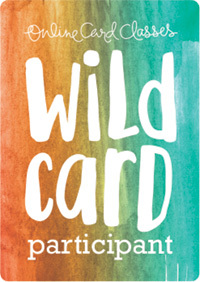 The first one I chose was a round card -- the Beat Goes On! As you may know, I'm a Twilight fan. I printed off an image of the sheet music from Bella's Lullaby and used it as my background. I stamped the piano and colored it with Prismacolor markers. I then used a Versamark pen and went over the image and embossed it with clear ep. The colors are Twilight colors -- red, black, and white. 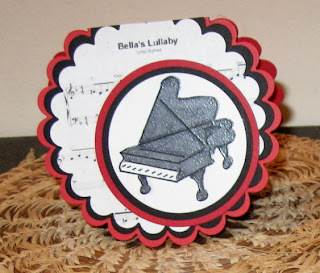 The bottom edge is cut with a Spellbinders Pierceabilities die, although I did not pierce.This card also qualifies for the Stampin'B's challenge this week to use both heat and dry embossing. After stamping and cutting out the bird, I popped him up on pop-dots, except for his feet which I adhered to the branch with a glue pen. The images are all from Flourishes Home Tweet Home set. The coloring was done with Copic markers. 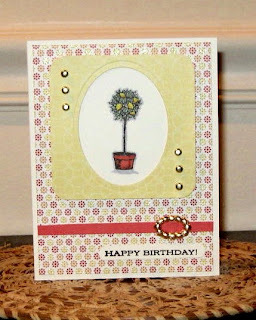 As the images are all embossed, this card also qualifies for this week's Stampin'B's DT Blog challenge to use both dry and heat embossing. 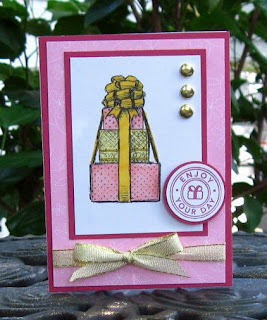 Joanne (jojot) was the hostess for this week’s Stampin’B’s DT challenge – to use both Heat and Dry Embossing. 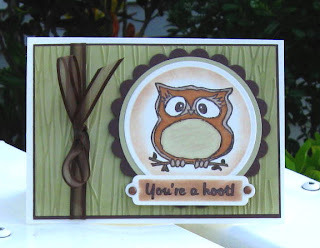 It was fun, especially with this cute set – Owl Occasions by Sweet ‘n Sassy Stamps. I stamped Olivia the owl with Chocolate Chip pigment ink and embossed her with clear embossing powder. After cutting out the circle using a round Nestabilities die, I sponged the Creamy Caramel before removing the die, which gives an extra “layer” to the circle. I then double mounted it on River Rock (regular circle) and Chocolate Chip (scalloped circle). The background of River Rock was run through the Cuttlebug, using the Forest Branches embossing folder and then sponged with River Rock. I added the embossed sentiment in a Spellbinders Double-ended Tag and a ribbon; and I was done. 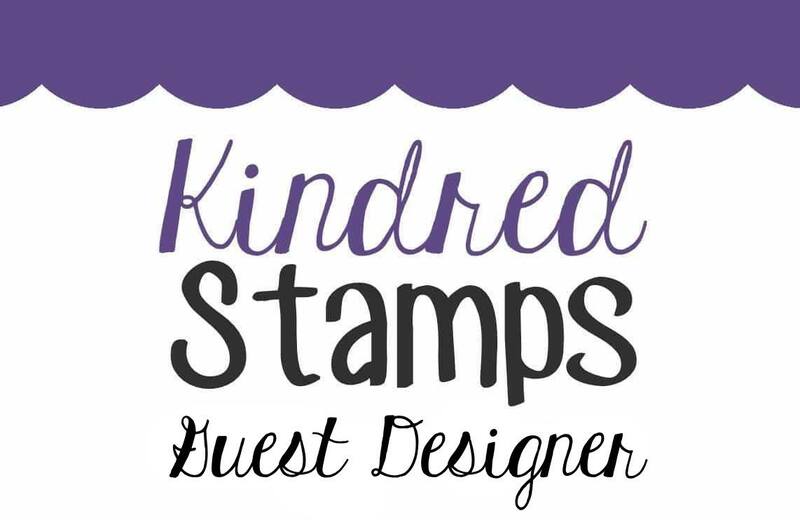 Sweet 'n Sassy provided the stamps for this week's and next week's Stampin'B's challenges. Do you remember the Lemon Tree song by Peter, Paul, and Mary? Or are you too young? When I first saw this new set by Flourishes, that's what I thought of. 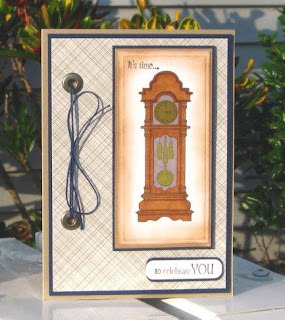 This card is my first with this set -- for this week's Timeless Tuesday Challenge on the Flourishes Newsletter, a sketch challenge. I stamped the smaller lemon tree onto Very Vanilla. Both DPs are from DCWV's new pad called Citrus -- how appropriate. The oval is cut and embossed with an oval Nestabilities die. Instead of ribbon, I used a small strip of cardstock and ran it through one of the new Ribbon Slides from the Flourishes store. The sentiment is from their Sweet Violets set. I admit it -- I'm one of those Twilight Fans, a proud member of Team Jacob! 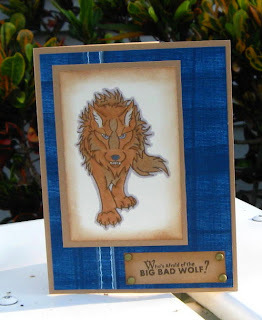 I used this week's SCS Technique Lovers Challenge of Faux Denim to show off my favorite character in the Twilight Series, Jacob Black a/k/a the shape-shifting wolf. My faux denim is a combination of Lynn Mercurio's directions for the denim and Ellen Hutson's The Classroom tutorial for the seam. I used my new Scor-Bug to make the stitching holes. I love these new stamps from Artful Inkables, designed around one of my favorite book series. Today I was playing with the Embossing Only with Nestabilities technique from the latest video on Stamp TV. The first card is for the Featured Stamper's Challenge on SCS. Christy S. has a wonderful gallery, and I chose her Wind to CASE. After stamping the image, I masked a rectangle and made the clouds. Then I used the Nestabilities die to make the embossed frame. 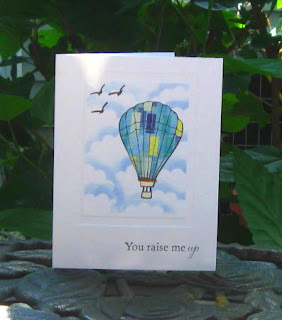 I stamped the hot air balloon again on a piece of Basic Grey Lime Rickey DP and glued in onto the original image. The kids' parade from the Flourishes' Patriotism on Parade is stamped within an embossed Long Rectangle Nestabilities frame. The bunting is also from that same set. I was able to use alcohol markers on the single-layer card because the Gina K Design Pure Luxury White 120 lb. cs is thick enough so that the ink doesn't bleed through to the other side. While the die was still on the card, I sponged the Bashful Blue around the top and sides. 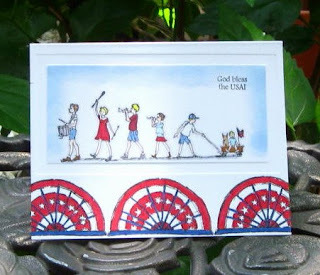 I am sending this card, along with a few others, to Flourishes for their Cards for Heros project. 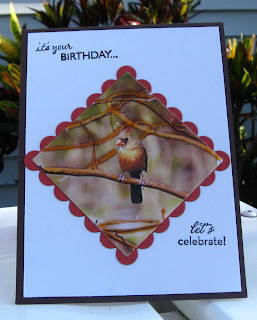 This week's Stampin' B's challenge really put me to the test. When Nicole said “watercolor,” I shuddered but decided I’d better plunge right in! Watercoloring is NOT my forte! But I guess that’s what challenges are for, to make you go outside your comfort zone. 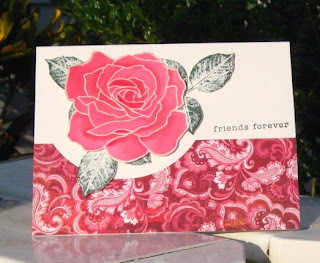 I stamped the rose from SU’s Fifth Avenue Florals with Versamark onto Shimmer White cardstock and clear-embossed it. Then, as I was using Real Red ink and an aquapainter, I tried to remember what Faith (Markie’s Mom) had said about using lots of paper towels when you watercolor. When I got the rose to what was acceptable to me, I let it dry and cut it out. The leaves are stamped with Handsome Hunter and cut out. Not wanting to take away from the flower by putting the Basic Grey Bittersweet DP under it, I cut out a section of the DP with a round Nestabilities die before gluing it down. The rose and leaves are all on pop-dots to give a 3-D effect. The simple sentiment is from SU’s So Many Sayings. After I made my first card, I watched a tutorial on Patty’s Stamping Spot on watercoloring the rose from Fifth Avenue Floral and decided to give it a try. I had to watch the tutorial twice before I was half-way comfortable in starting. 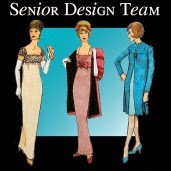 This technique was explained at a Stampin’ Up regional meeting. 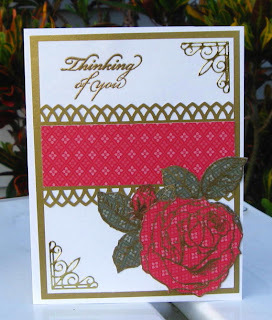 The roses were stamped in Whisper White on SU Shimmer White cardstock and clear embossed. After spraying the paper with water, you lay down reinkers with an aquapen and let the color spread through the sections of the rose. I’m definitely going to try this technique again. The leaves are Sizzix die-cuts, cut from Garden Green cs and sponged with Always Artichoke; and the butterflies are punched from YoYo Yellow with a Martha Stewart punch. I didn't do much stamping yesterday. My daughter-in-law came over to make a Father's Day card for my son, and I was acting as coach. But I did have time to get one card done -- a birthday card for my brother-in-law. When I saw this new set from Gina K. Designs, which actually has two clocks in it, I knew I had to have it. I just love this grandfather clock. It's stamped on white and sponged in Creamy Caramel. The image is colored with Prismacolor and Copic markers. Most of my alcohol markers are Prismacolor, but I am accumulating a nice collection of Copics, too. The clock works are colored with a gold marker; but, after I colored the face, the numbers were hard to see. So I stamped the top of the clock again on a piece of gold cs and punched it out with a 5/8 inch round punch. The bg paper is from a pad of Martha Stewart DP which I found on clearance, and I thought the eyelets and twine were all the embellishment needed. Father’s Day is this Sunday. The only fathers currently in my life are my two sons, so these two cards are for them. My older son Doug just became a father at age 44. When he got married last year, he became an instant step-father to my daughter-in-law’s two children. Since then they have had a son, William, born in September. 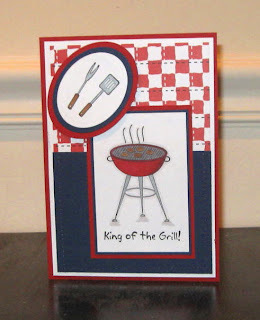 Doug likes to barbeque, so I thought this card would be appropriate. I used Gina K Designs’ new set King of the Grill, coloring the image with a combination of Prismacolor and Copic markers. My younger son Scott has three children. 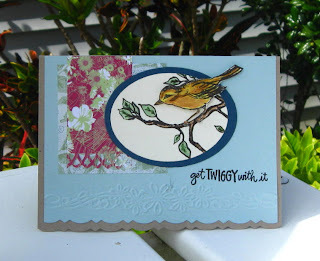 This card was actually made for this week’s sketch challenge on Stamp TV. I used another new Gina K Designs set, Special Fathers, for this one. The smaller clock in the set was just the right size for the round card. This image was also colored with markers. 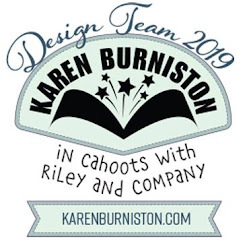 This week's hostess for the challenge on the Stampin' B's Design Team Challenge Blog was Vicky Gould. When Vicky sent me a small pack of monograms, I thought “How sweet of her.” Little did I know that this was a prelude to Challenge #10 – to use monograms on our cards. Obviously, L is for Lois; but it’s also for Lilacs. Flourishes Lilacs Set is one of my favorites. I colored the image using a combination of Prismacolor and Copic markers, masked it, and stamped the Itty Bitty Backgrounds all around. A gift from a dear friend, the Nestabilities Labels Three made a perfect frame with some Creative Imaginations DP, matted on Wild Wasabi, pierced in the corners, and sponged all around with Perfect Plum. 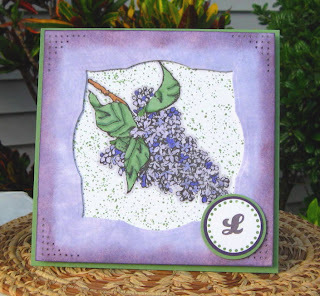 I chose one of the smaller “Ls” in the monogram pack, stamped it in the center of one of the stamps in SU’s Think Happy Thoughts, and matted in Elegant Eggplant and Wild Wasabi. Two of my grandchildren, brother and sister, are celebrating their birthdays later this month – one day apart. They live in Alabama, and I live in Florida; so I don’t get to see them very often. 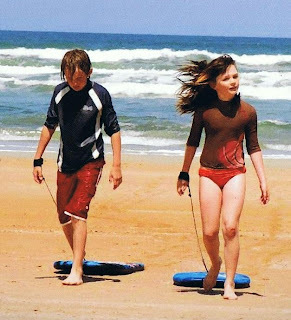 This is a picture of them at the beach last year. I wanted to make birthday cards for them that were a little different, so I opted for “clothing.” Calvin’s card was made with a TooMuchFun stamp of a sweatshirt. 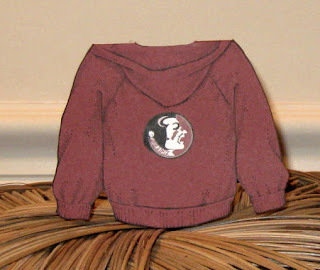 Their father (my son) graduated from Florida State University, so I chose FSU colors (garnet and gold) for the card. I printed the Seminole’s logo onto a label, cut it out, and attached it to the back of the card. Go ‘Noles! 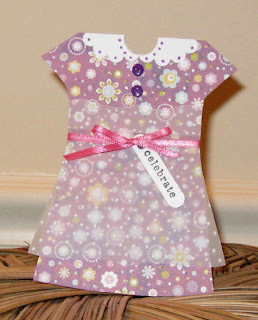 A month or so ago during the Featured Stamper challenge on SCS, several people (me included) chose to CASE a card that looked like a little dress. 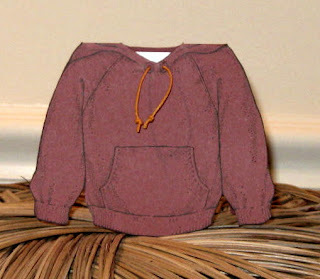 The pattern was downloaded from Paper Craft Magazine on-line. So for Wyatt’s card I decided to make another dress card using the same pattern. I cut the dress from a piece of cardstock from DCWV’s Pocketful of Posies’ pack; and the apron is vellum run through the Cuttlebug with the Swiss Dots folder. The little tag was stamped with one of the many sentiments in So Many Sayings and punched out with SU’s Word Window Punch. I won't get to see Calvin and Wyatt on their birthdays, but they'll know I love them and am thinking of them. 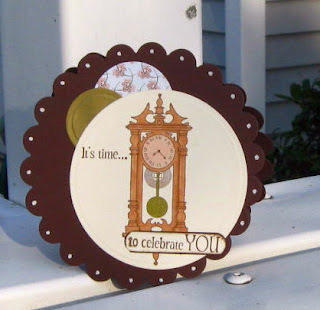 It's time again for Timeless Tuesday on the Flourishes Blog. This week the challenge was to use designer paper on our cards. As soon as I read the rules, I knew exactly what I wanted to do. 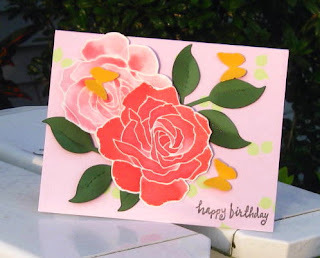 I chose to stamp directly on the DP and cut out the large rose, three leaves, and rosebud; and then cut them out. Because I was using the DP, I didn't want to take away from it with the card layout, so I just used a simple sketch, white background with a little bit of gold accents. The Martha Stewart border across the middle with a stripe of the same DP seemed enough, although I added two ornamental corner stickers to balance out the large rose image. I just received my new Stamp TV Eclectic Summer Kit. What fun images! 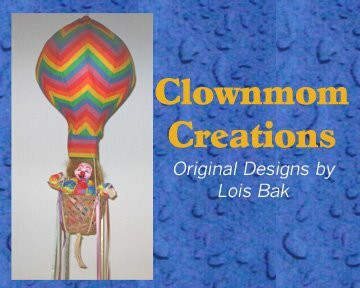 As you can see on the header of my blog, I love hot air balloons as well as clowns. 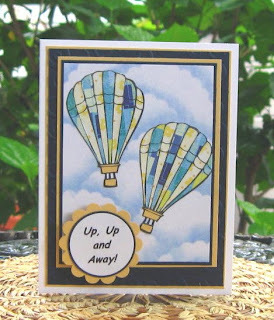 The first card I made using the images from the new kit was paper piecing using the hot air balloons. Using the tutorial on the Stamp TV site as a guide, I stamped the balloon on two different pieces of patterned paper and cut out the sections, gluing them down with a Quicky Glue Pen. After creating the cloud backing with a scalloped circle and a sponge dauber, I stamped the balloons over the background and glued down the paper pieces. The sentiment was computer-generated. Today's Featured Stamper on SCS is Kisa. In looking through her gallery, I chose her Just Bugs card to CASE. 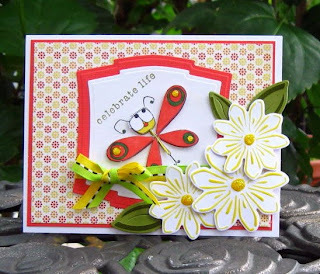 * Instead of primas, I used Spellbinders Daisy die cuts.I also added some stickles to the centers of the daisies and the spots on the dragonfly's wings. 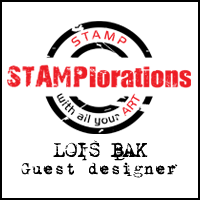 I am the hostess for this week’s Stampin’Bs DT Challenge. My brother-in-law is an avid photographer, and it was because of some of his photos that I came up with this challenge to use a photograph on our cards. This was such fun that I actually made two cards. I had to print out several copies of this photo and piece them together to get the scene to the right size. All the stamped images from My Favorite Things’ By The Seashore were colored with Prismacolor or Copic markers and cut out. After coloring a small piece of cardstock using the faux wood technique, I cut out the shape of the dock and assembled my little scene. 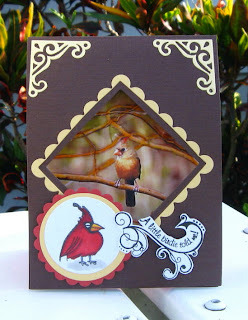 The sentiment was cut using a label die from Spellbinders and then backed with a piece of ribbon. Bob loves to photograph birds. This lady cardinal is another of his photos. I cropped a much larger shot of her so that she was about the only thing left in the photo. To add a little dimension to the photo, I went over all the branches with some glaze pens. After cutting out a large square in the brown card base with a Nestabilities die, I glued the photo to the inside of the card to line up through the cut-out portion. I then cut a “frame” using two square Nestabilities. The corners are Cuttlebug Vintage Corner dies. As you probably know, cardinals fly in pairs, so I had to have her “mate” close by. He’s actually from Inkadinkadoo’s Bird Assortment, but the sentiment is from My Sentiments Exactly’s Little Birdie. This week's Timeless Tuesday Challenge on the Flourishes Blog is all about frames. I made a frame using two Nestabilities Labels Four dies, cutting a piece of DP-enhanced chipboard. I added a few blossoms to the stem stamp from Summer Blossoms, along with some primas and jeweled brads on the frame. The background DP is from Basic Grey's Lilykate pad. 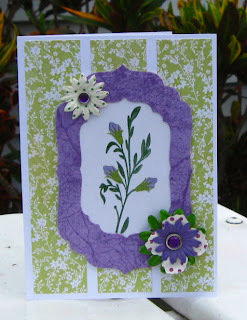 Yesterday was the final day of the week-long Stampin' Out Alzheimers challenge marathon. The total raised for the Alzheimers Association was well over $6,300. Not only was it a lot of creative fun, money will go to such a good cause. I'm sure many of us have been touched by Alzheimer's Disease in some form or another. This card was another sketch challenge. 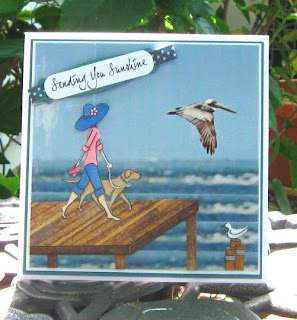 I used one of the stamps from Flourishes' All Wrapped Up set, plus a sentiment from SU Riveting. I'm still getting the hang of using alcohol markers, trying to get shading is not the easiest -- but I'm learning. Most of my alcohol markers are Prismacolors, with some Copics added to the mix. This card, also a sketch challenge, is actually going to another good cause. 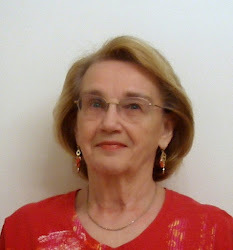 Anita Autore, who also participated in the Stampin' Out Alzheimers week, is gathering a box of cards to send to the 184th battallion of the Army Reserve Unit from California, which is currently serving in Kosovo. This cute little guy is from the Hero set from The Greeting Farm. I'm not sure of the name of the DCWV patterned paper, but it sort of looks like Army camouflage.